The reagent will cause direct agglutination (clumping) of test red cells that carry the D antigen and indirect agglutination of test red cells that are Category DVI in the antiglobulin phase of testing. No agglutination generally indicates the absence of the D antigen. 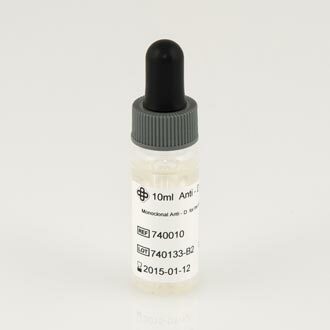 Lorne Monoclonal Anti-D DuoClone blood grouping reagent is a low protein, blended reagent containing a human monoclonal IgM and IgG Anti-D, diluted in a phosphate buffer containing sodium chloride, bovine albumin and macromolecular potentiators. When typing patient samples, this reagent will directly agglutinate Rh D positive cells, including majority of variants (but not DVI) and a high proportion of weak D (Du) phenotypes when using the slide, tube, gel card & microplate techniques. It will agglutinate DVI cells in the IAT phase of testing.